What a contrast in the weather from one week to the next, when we spent Christmas Day at Al Shaheen in Karakum, it was a warm and sunny day, however, the 31st December was drizzly and extremely cold but this did not deter the people who wanted to let the New Year in and on arrival at the restaurant we were greeted with a lovely log fire and heaters around the room. Imtiaz had even gone as far as giving the “smokers” a separate area away from the restaurant with a heater so that they did not have to venture outside in the cold. Now that is really considering and looking after your customers. Well done Imtiaz, you are a star. There was a lovely menu to choose from and we chose 3 different starters – prawn cocktail, soup and pate. For the main course we decided on 2 x steak with different sauces and salmon, which were all perfect and were served with a large assortment of vegetables and sauté potatoes. No room for a dessert for 2 of us unfortunately but there was a nice selection available and Chris decided on apple pie and custard. The entertainment for the evening was by Col Coleman, a very relaxed singer who started the evening off with some slow background songs while people were eating and chatting and as the evening went on so the tempo increased which persuaded the diners onto the floor to enjoy Col’s wide repertoire of favourite songs. There were many people we knew who had decided to bring in the New Year at Al Shaheen and time went by so quickly that we were soon having the countdown to midnight, 10 – 9 – 8 – 7 – 6 – 5 – 4 – 3 – 2 – 1 and off went the huge party poppers which had been supplied by the restaurant and people were milling around wishing Happy New Year and there was a group in a circle with hands joined singing Auld Lang Syne, it is always such an emotional moment. 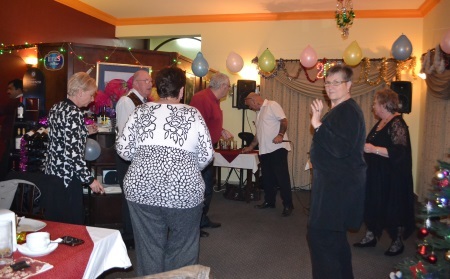 The Al Shaheen staff then started popping corks and serving champagne to the guests with mince pies and after-eights arriving at our tables and coffee for those that wanted it. Lastly, Zafer came around with a tent shaped calendar for everyone, another lovely touch and very much appreciated. It seemed that no-one really wanted to go home so for quite a while there was much conversation going on before eventually people ventured out in the cold for their journey home. When we arrived home we sat and watched the fireworks on TV in London and Edinburgh. It was a nice ending to 2015 and welcome to 2016. 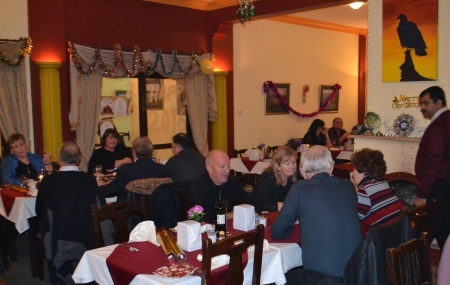 We had an excellent evening and I am sure everyone will join us in thanking Imtiaz and his brilliant staff for the attention they gave to everyone and the great entertainment from Col Coleman to take us from 2015 into an exciting 2016 when we hope to see more of Col. 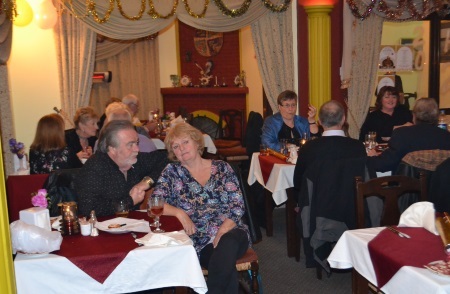 There are more pictures of this brilliant evening in the slideshow below and you can also see a video with clips of Col Coleman entertaining the New Year revellers. 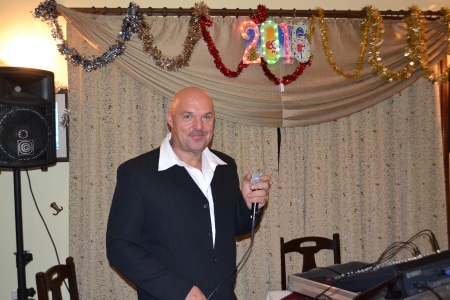 This entry was posted in Special Events and tagged Al Shaheen Karakum, Entertainment, New Year's Eve in North Cyprus, North Cyprus, TRNC by kyreniacatkin. Bookmark the permalink.